The Samsung Galaxy A3 is the junior member of the company's new metal-clad lineup. The least likely one to challenge the Alpha-dog but just as slim and sharp as the rest of its Galaxy A teammates. And it's not all about the looks - with LTE and Super AMOLED available across the range, the Samsung Galaxy A3 has the same 64-bit chipset as the A5 and the same high-res front camera as the A7. Most of the other specs are of course duly toned down but the A3 is a pretty credible midrange package on its own. It comes in single and dual-SIM flavors, which is a popular combo in the midrange - and does well to offer cat. 4 LTE on both. The high-resolution selfie camera is still quite a novelty for Samsung - the A3 is among the few very recent phones to have one. A Super AMOLED screen of qHD resolution and a 4.5" diagonal and a Snapdragon 410 chipset under the hood are looking competitive enough. So far so good. Samsung needs a strong start into 2015 after ending 2014 on a low note. 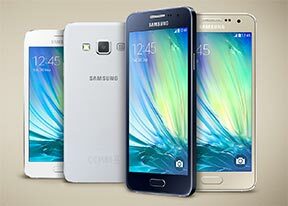 The Alpha bloodline will be Samsung's trump card in the midrange and the Galaxy A3 will soon be joined by its bigger, better-equipped siblings. But here and now, the Galaxy A3 will be keen to prove it has enough to offer. Where the Galaxy A3 comes short is display resolution. However, the Super AMOLED display should make up for the relatively low fidelity with great contrast and punchy colors. The Snapdragon 410 chip, which isn't going to break the sound barrier, but is of the new 64-bit generation and won't be dealing with too much stress considering the screen resolution. It packs enough oomph for a midranger and things will only get better when Samsung are done with the Android 5.0 Lollipop update. Ready when you're. Let's proceed with our usual routine. Coming up, unboxing and design.